The year 2017 is approaching the end… I just resigned from the OKC Steering Group – where I have basically served from the very beginning in 2008. I also handed over the Extreme Object working group which I have stewarded the past six years. Evan O’Connor and Stephan Rosswog will continue that job. At the end of the year, I wanted to look back at what has been an interesting year for transient astronomy. Starting in December last year, we published an article on a new very-bright transient which we interpreted as a tidal disruption event. The paper was led by my former PhD-student Giorgos Leloudas, previously a postdoc at OKC and now at DARK. The paper was published in the very first issue of Nature Astronomy. Here is a cool animation of an artist impression of the star being stripped apart by the supermassive black hole. There was media attention for this both in Sweden (SU press release) and in the rest of the world (ESO press release). 2017 was supposed to be a calm year, since we closed down our old supernova telescope to upgrade to the new ZTF camera. I started in January observing for a month in sunny Chile for PESSTO together with Francesco Taddia. Swedish TV made a piece on this. In February, Cristina Barbarino and Anders Nyholm took over in Chile and Francesco and I did the data reduction from colder Stockholm. In February we published the fastest catch ever of a young supernova. The paper on iPTF13dqy was published in Nature Physics, and led by Ofer Yaron at Weizmann. It includes a spectrum taken only 6 hours after the estimated time of explosion for this Type II supernova. In February we also learned that we were approved a new research environment from VR: the GREAT centre for Gravitational Radiation and Electromagnetic Astrophysical Transients, led by Ariel Goobar, Hiranya Peiris and Stephan Rosswog. This gave us a head start in this field. 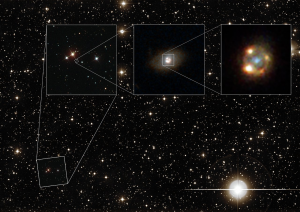 A more unexpected discovery was the multiple lensed supernova iPTF16geu. Ariel Goobar and Rahman Amanullah led this paper published in Science. That was just in time to mention this discovery at the KAW Wallenberg 100 year anniversary in Lund, which I helped organize. I gave a talk about supernova hunting and the coming ZTF. In connection to that meeting, KAW had released their movie – an astronomical journey into space, that covers our research. Check it out! My 10 min presentation at the KAW 100 year symposium was filmed by UR and can be seen here. You can also check out the presentations from Jan Conrad, Matthew Hayes, and Josefin Larsson. In June we helped organize a large workshop at Albanova on the Physics of extreme gravity stars, and then – after the summer break – on August 17 came the first LIGO detection of a neutron star merger. We worked hectically during the fall until October 16 when we were allowed to release the results. Within ePESSTO we published apaper in Nature, led by Stephen Smartt in Queens – and within the GROWTH collaboration we participated in a paper in Science, led by Mansi Kasliwal at Caltech. More locally, we also published a paper on macronova nucleosynthesis, led by Stephan Rosswog. We invited all of Albanova for a short colloqium (Goobar, Sollerman, Finley, Rosswog – film here) and some drinks. In my more local universe, two of my PhDs students published their first first-author papers: Anders Nyholm on the bumpy Type II supernova iPTF13z, and Emir Karamehmetoglu on a very long lived Type Ibn – OGLE73. Christoffer Fremling defended his PhD-thesis and went off for a postdoc at CalTech. In November we published a paper on the very long-lived iPTF14hls, led by Iair Arcavi in Santa Barbara and presented an unusual re-brightening supernova, nicknamed the zombie star in some of the following media coverage. Then, finally, on November 14 2017 we could announce first light for our new ZTF camera. This is a large step forward for transient surveys. This is indeed what we have been working towards for several years now, with help from KAW funding. This interesting animation done by Rahul Biswas shows how the ZTF will work through the night sky and detect numerous active supernovae each night. So, in the end, I am looking forward to 2018 when ZTF will become fully operational – while at the same time concluding that in terms of transient science 2017 was very good indeed. 205 Swedish birds in 2017 was also not bad.